When Richards arrived at the O’Connor campus, she was greeted by Principal Susana Mathis, Superintendent Bob Brezina and the school choir, directed by Lucille Araj. Students lined the sidewalk and hallways to get a glimpse of the governor. Richards said she always asks children how they are doing in school and if they like math. “Younger children usually say they like math, but the older they get, the more they say they’re not good in math or don’t understand it,” Richards said. “I think the quality discussions about what children are actually learning and what we’re turning out of the public school system will be the next big debate in Austin,” she said. Richards praised Shoecraft and the support given his math concept by the UHV faculty. “The University of Houston-Victoria is doing a remarkable job and their campus here is truly important in the higher education system of this state,” she said. “A lot of times the big thing that holds back education is the fear of trying something new,” she said. Gov. 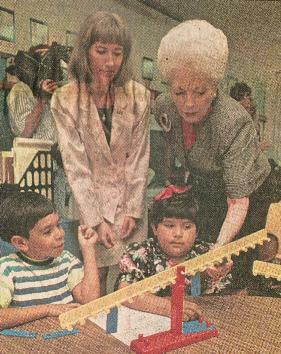 Ann Richards admitted she found more than she bargained for while visiting classrooms at O’Connor Elementary School Friday. Richards was in Victoria at the invitation of university of Houston-Victoria President Glenn Goerke to see firsthand the Move It Math program developed by Paul J. Shoecraft, an associate professor of mathematics at UHV. Richards received a briefing and watched a short video at the UHV Petroleum Training Institute, then went to the O’Connor campus to see first- and second-graders breeze through “monster” addition, subtraction, multiplication and division problems. Move It, an acronym for mathematics opportunities, valuable experiences and innovative teaching, focuses on the skills and thought processes children must acquire to succeed in mathematics. “Move It Math is a quantum leap ahead” of traditional math instruction concepts now taught in Texas classrooms, Richards said. The governor is no stranger to the classroom. 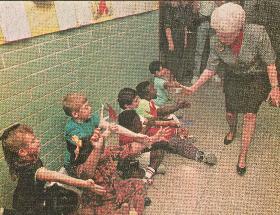 Prior to entering politics, Richards taught school at the intermediate and high school levels. “I have been in a lot of classrooms, but never in one where independent work was going on as successfully as what I have seen taking place here,” she said. “Any exposure to this program would certainly convince people at the Texas Education Agency that it’s worth emulating statewide,” Richards said. Richards giving a “high 5”: Gov. Ann Richards has to bend over to give students a high five as she walks down the corridor at O’Connor Elementary Friday to see kindergarten and first-grade students demonstrate a new math concept developed by UHV Professor Paul Shoecraft.